Measure the temperature and oxygen content of a pond over the course of a day. Then go fishing to see what types of fish live in the pond. Many different ponds can be investigated to determine the influence of time, temperature, and farms on oxygen levels. 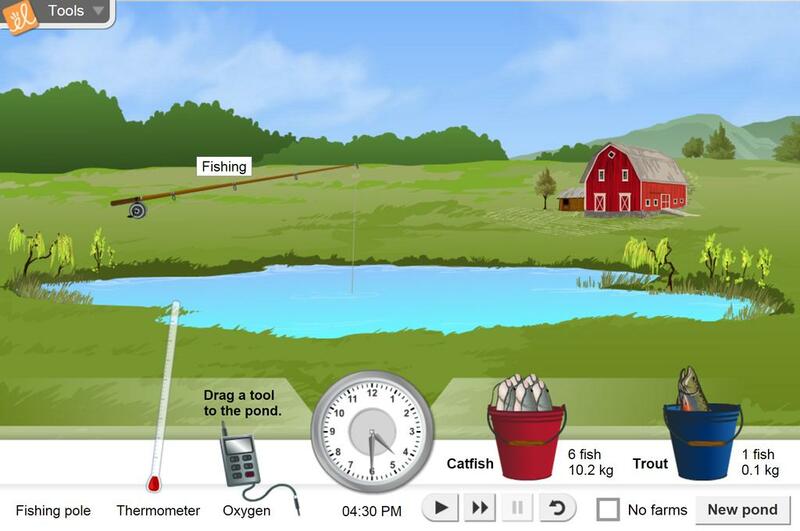 Investigate how the levels of dissolved oxygen in a pond vary throughout a day. Learn the source of dissolved oxygen in a pond. Determine the effect of dissolved oxygen on the fish in a pond. Compare dissolved oxygen levels in warm and cold ponds. This CER worksheet allows students to deepen their understanding of how land use affects water quality. S... (more)tudents design and complete an experiment, make a claim, and provide evidence and reasoning to explain. Great learning experience for understanding the many factors involved in eutrophication. This Gizmo can be used for several goals. I am using it to stress the interaction of biotic and abiotic factors. Great for teaching the relationship between biotic and abiotic factors. How oxygen impacts the life around us.